Junk of the Heart – These Two Eyes! 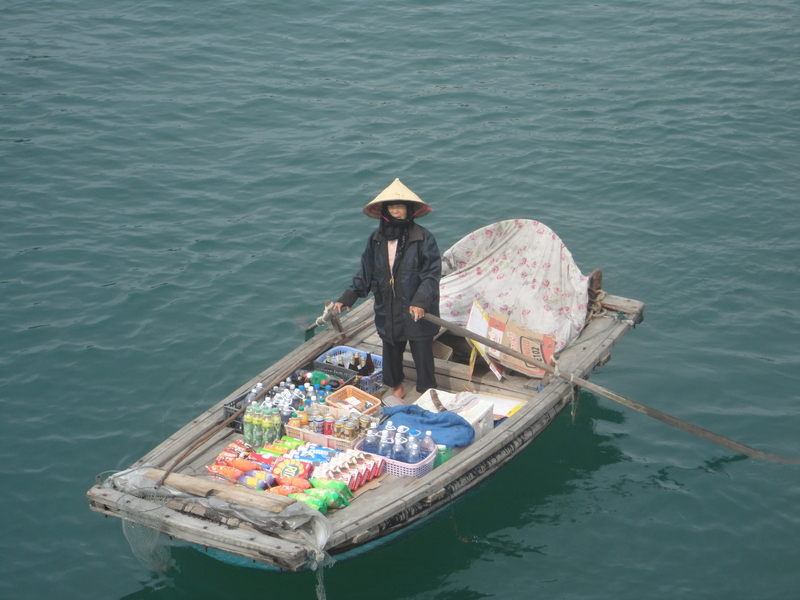 Finding a flawless junk boat to cruise the picture perfect waters of Ha Long Bay isn’t an easy task. They can range $30 for a one night, two day cruise to up to a couple of hundred. You can go economical, with an extra dash of rats to compliment the grime, or pay a premium for a bit more comfort knowing your odds of sinking may be in your favor and the seafood has been caught fresh that day. Divine Hanoi Rendezvous Hotel didn’t give us much of a choice when they offered the option aboard Oriental Sails, in which they partner with. For $119 USD a pop, we knew we were on the steeper end of the scale, potentially sacrificing a late night party and a backpacker social scene for elegance and safety. I thought go with the recommendation and know we are booked in, rather then scour the internet and take a bigger risk with another chain. We were picked up bright and early from the hotel after finishing off our complimentary breakfast of the staple Vietnamese dish of pho. After stepping into the van to begin our four hour journey our predictions were confirmed; two Vietnamese couples and a young French/Italian pair accompanied by her parents. And that was it, the lot. Or so we thought…until minutes after leaving the center of Hanoi to set off to the coast we pulled over to let some stragglers on. And we were in luck, 3 cute Kiwi guys! The journey northeast was slightly bumpy but overall a breeze, as the cushy bus with a/c was a treat in the exhausting northern heat. We stopped off at a lacquer factory which supports disabled people with affects of agent-orange who create beautifully sculpted lacquer figurines and hand sewn, life-like pictures of Vietnamese countryside’s, flowers, sunsets and more. After a few hours of our tour guide Tuan, who tried incredibly and sincerely to get a good vibe amongst the group by initiating corny ice breaker games and getting a bit of karaoke going on the bus, we arrived at the port in the Gulf of Tonkin to board the beauty otherwise known as Oriental Sails Deluxe. What’s a shame is that the “junk boats”, modeled off of the Chinese sailing vessel design, were stripped of their signature brown wooden exterior with towering, powerful sails to be painted all white in a need to make them all look the same, the assumption that it would be more aesthetically pleasing to tourists. I think looking back this mistake will be one for the history books to have ruined the symbolic look and value of the vessels. Taking in the masses of boats polluting the bay and getting ready to sail for the night, we settled into our cabins and were greeted with a welcome drink before sitting for lunch. This is where it began to get really good! Amazing seaweed, fried fish, octopus, beef, pear and the list goes on. Tuan joked with us about being served dog, something that is quite a delicacy to locals however they typically keep it off of tourist menus as it doesn’t appeal to too many. Really, wonder why? Poor Rover. The bay, being a Unesco World Heritage Site, is full of jutting limestone cliffs, tucked away caves, and clear aqua water. 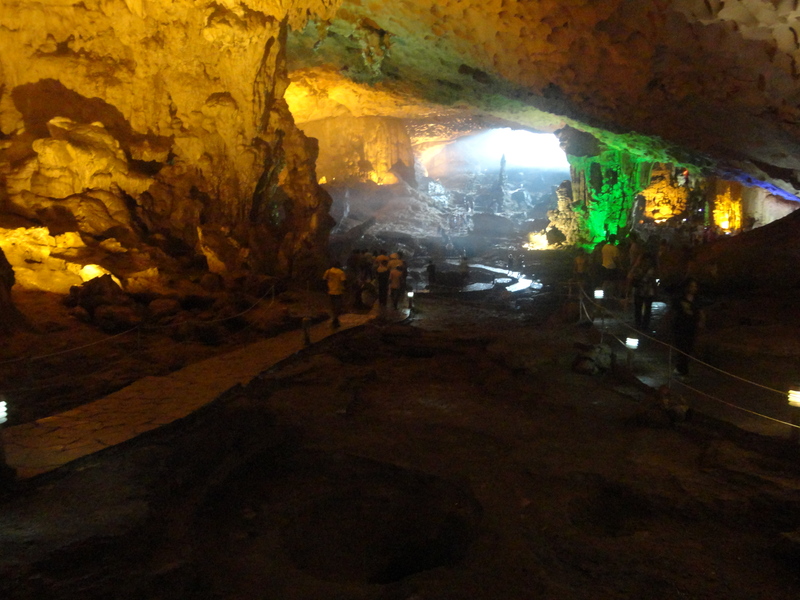 We stopped off for a visit to the Amazing Cave (Sung Sot Cave) and a kayak along the outskirts of the bay. Always a word of advice to kayakers is to hug the land. Unfortunately for some other tourists, we witnessed them being run over by a junk boat, their kayak submerged and their life vests kept them afloat and visible to be rescued. Only in Vietnam do you get run over by a junk boat. After returning from the long and strenuous, yet breathtaking (literally) kayak adventure, some bought beer, snacks and cigarettes from the “floating markets”, or more realistically, women in wooden boats offering cheaper alternatives to the overpriced snacks aboard our vessel. Still, it was a perfect picture to take. 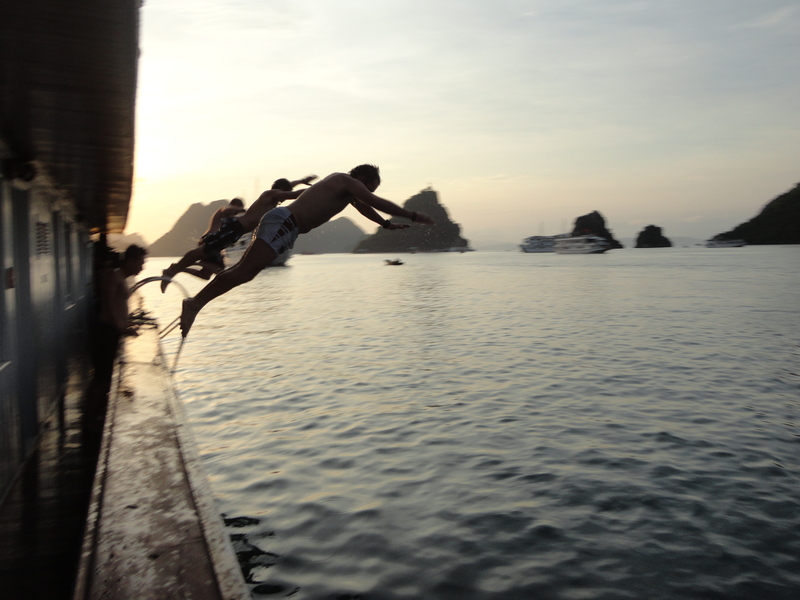 Then as the sun set we photographed and observed the boys doing flips off the top deck into the ocean. One guy was nearly inches from a giant jellyfish with tentacles approximately two feet long. The water was so clear we could see it from the deck, and all I could think was, man, I’m so glad I’m not in that water and up here safe just watching. The trip itself was one of the most memorable of all of the places in Vietnam. The striking landscape of large lime stones contrasting against the calm sea is unforgettable. We were truly at ease and finally on vacation; something much appreciated after the busyness of Hanoi. The food at dinner was endless: crabs, shrimps with their heads on, vegetables cut into flower décor, fresh fish. It was exquisite. Afterwards the Americans girls and Kiwi boys sat up all night learning new card games and swapping stories until the French mother stormed up and told us abruptly in a language we didn’t understand, hands flaring, that it was time to go to bed. The next morning, after paying the bill for beverages I consumed aboard, I joined the $1,000,000 Dong club. That’s less than $50 USD. Yes, what beautiful place! The Gang: The Americans, the Kiwis, and Tuan the tour guide!